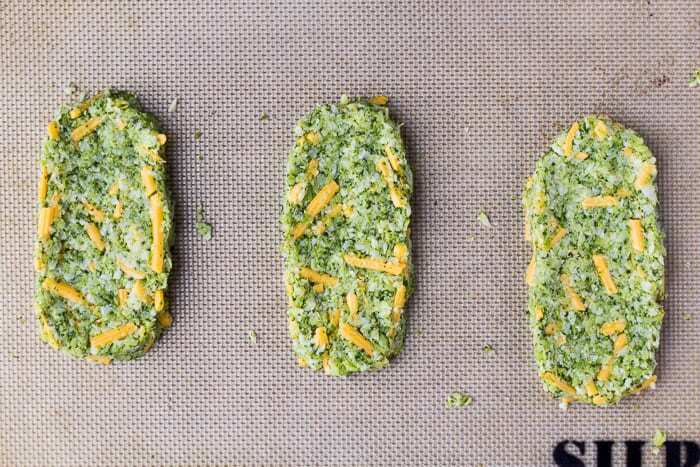 Broccoli Cheddar Cauliflower Hash Browns are a delicious, low carb side that’s perfect alongside eggs and bacon! Following a low carb diet or keto diet is hard! There are so many recipes out there that aim to make it easier and more delicious. It just seems that we’re always still looking for the next tasty recipe to replace those high carb foods we miss. I know I am. While it does get easier, every time I have to walk past a fast food restaurant, the cravings for french fries and hash browns is serious. 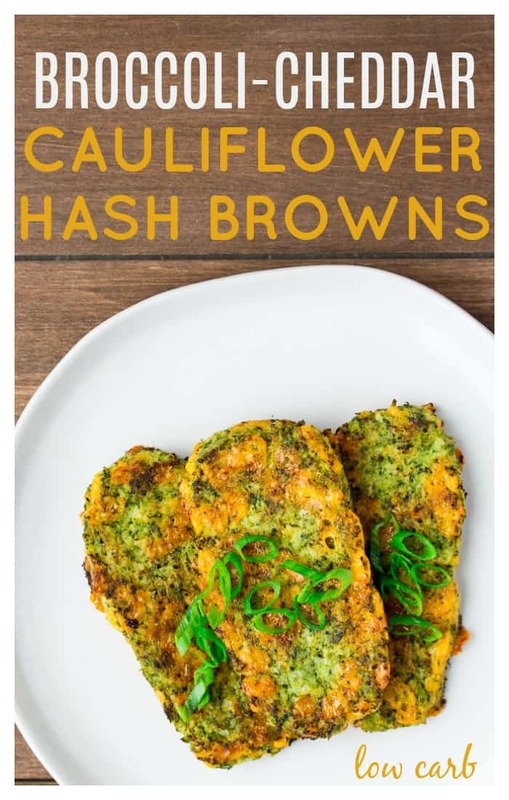 I have seen some cheese cauliflower hash browns floating around Pinterest. And while I love a good fauxtato recipe, sometimes a little shake up is necessary. This time that shake up is in the form of broccoli. I didn’t stray too far, but the change is flavor is nice once in awhile and if there’s anything I love as much as cheesy cauliflower, it’s cheesy broccoli. I left half the cauliflower in this recipe for Broccoli Cheddar Cauliflower Hash Browns and mixed it with an equal amount of broccoli. Throw in plenty of cheese and an egg to bind it all together and you have yourself a delicious side dish recipe to serve alongside those low carb eggs and bacon! Rice the cauliflower and broccoli. 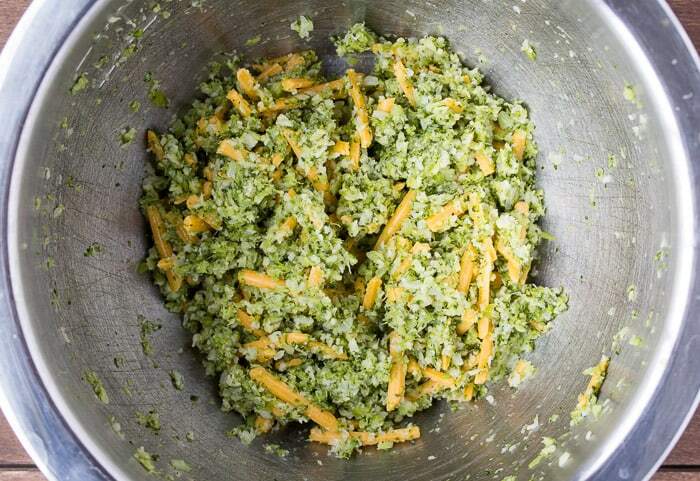 I used my food processor for this, but you can use a box grater , if that’s all you have. Shred the cheddar cheese, if necessary. Combine all the ingredients in a medium bowl and stir until well combined. Form into 6 even sized patties on a baking sheet. I line mine with a Silpat mat and the hash browns slide right off! You can shape them anyway that you like. Bake for 10 minutes, then flip and bake for another 10 minutes. If you’re going to be serving these at a brunch, you can stack them up and top with some sliced green onions for garnish! 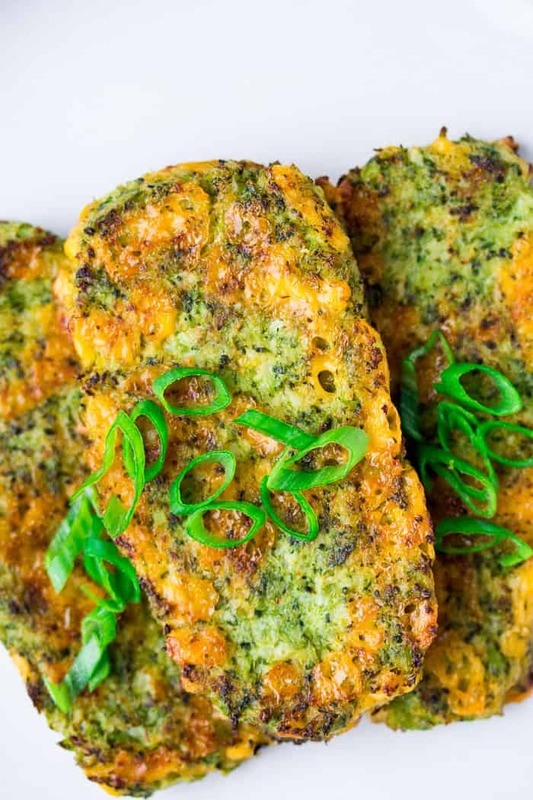 Love this Broccoli Cheddar Cauliflower Hash Browns recipe? Follow us on Pinterest, Instagram, and Facebook for more! Preheat oven to 400°F. Line a baking sheet with a Silpat mat if you have one. 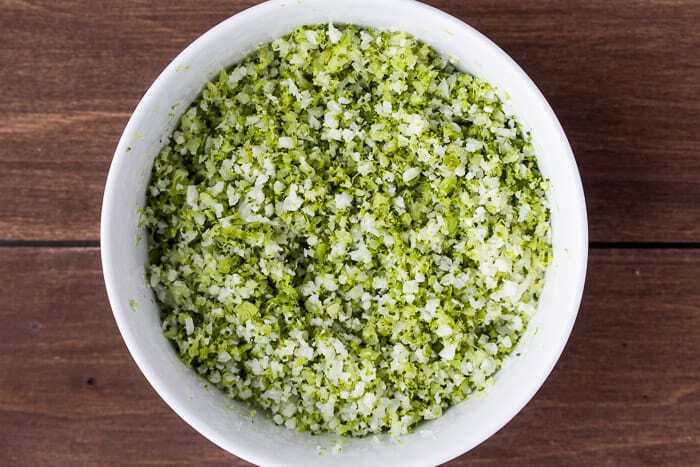 Place the riced cauliflower and broccoli in a microwave-safe bowl. Cook on high for 6 minutes. Dump out the riced vegetables onto a kitchen towel and let it cool to the point you can handle it without it burning. Once cool, wrap the towel around the vegetables and squeeze as much liquid as you can out of it. Place the vegetables back into the bowl. Add the cheese, salt, pepper, garlic powder, and egg and mix well to combine. Form into 12 even sized patties on a baking sheet. You can shape them anyway that you like. Bake for 10 minutes, flip, then bake another 5-10 minutes or until golden brown. Use fresh cauliflower and broccoli for the best results. Some grocery stores sell riced cauliflower in the produce department now if you'd prefer a little bit of a short cut. Shred the cheddar cheese from a block. Pre-shredded cheese is often coated in a starch to prevent it from sticking. This adds to the carb count and doesn't melt as nicely. Store extra hash browns in an air-tight container in the refrigerator and use within 3-4 days. 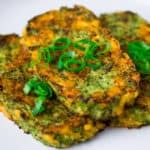 Can cauliflower hash browns be made ahead of time? 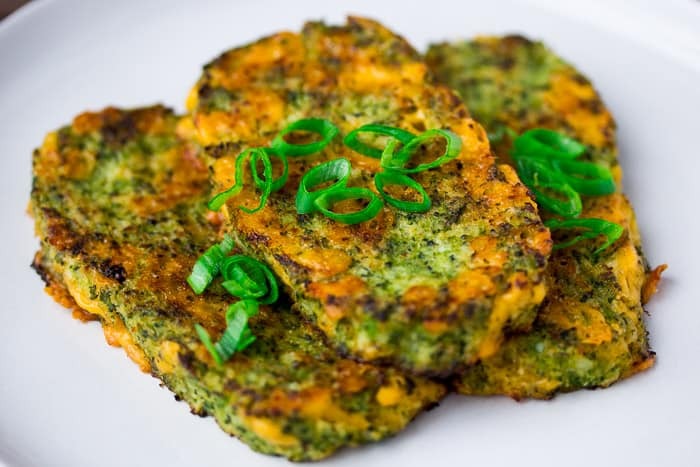 Cauliflower hash browns can be cooked ahead of time and stored in the refrigerator for a few days or in the freezer. Reheat them in the oven to crisp them up before serving. Can cauliflower hash browns be frozen? Yes. You can tightly wrap baked hash browns and store them in the freezer. Reheat them in the oven to crisp them up again.